Junior Ryder Worrell looks for an open teammate in the Trojans championship, Mar. 9, against Beloit as Girard prevailed 49-45 over the Trojans. The Trojans defeated their previous opponent, Thomas More Prep (14-12), 62-50 in their game Mar. 8, advancing to the 3A title game. For the third time in school history, Girard competed in the state championship game where in the previous two contests fell placing runner-up. Saturday, Mar. 9, Girard (21-3) tipped-off action against the Beloit Trojans (24-1) where the two battled it out for 3A boys’ supremacy. Beloit came into the game with four players averaging 7+ points as they defeated Perry-Lecompton (21-2) in their semifinal matchup, Mar. 8. Girard jumped out to an early 8-2 lead off hot outside shooting from senior Dillon Collins and Ryder Worrell. Beloit soon battled their way back into the game attacking inside the paint with their elusiveness and quickness. Senior Caleb Muia drained a three from deep in closing seconds of the first quarter opening Girard’s lead to 16-12 at the end of one. 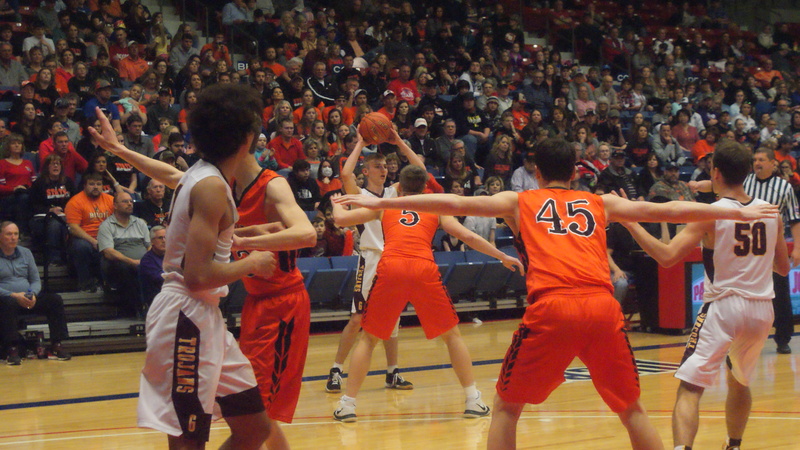 As Girard started to gain momentum, Beloit caught fire from deep making three straight shots from beyond three. Trailing 23-18 with 5 minutes remaining, the Trojans had a hard time stopping Beloit’s Carson Cox who went 6-6 on threes in the first half. Worrell knocked down a three in the closing seconds of the second quarter with Girard trailing 25-31 at halftime. 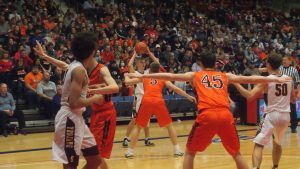 Beloit controlled much of the third quarter executing off second-chance opportunities and Trojan mistakes. Senior Carter Doherty went cold in the first couple quarters scoring his first basket of the game midway through the third. Muia would get into foul trouble forcing the senior to sit out half the quarter with 4 fouls. Heading into the final quarter, Girard trailed 41-36 looking to find a spark offensively. Beloit pushed the lead to as much as 7 within opening minutes of the fourth as the Trojans took advantage of Muia’s absence. Subbing back into the game, the game shifted with the Trojans starting to gain traction off senior Evan Troike’s key three-pointer. Another huge three-point shot from Worrell tied the game up for Girard as only 3:30 remained in the all or nothing matchup. After starting out cold, the post Doherty dominated the paint late in the ballgame executing off second-chance putbacks down low, pushing the lead to two. Beloit then missed their next basket with Muia coming down with the rebound and sinking two key free throws to push the lead to four. From there, Girard held off the Beloit Trojans (24-2) 49-45, capturing the coveted 3A State Championship. This milestone marks the first ever state title from a Girard boys’ team after multiple failed trips. Muia finished the night leading the Trojans in scoring with 17 points total. Worrell provided much needed shooting from outside finishing with 12 points for Girard. Other key contributions to the Trojans victory include; Troike (7), Collins (6), Gabe Muia (2).